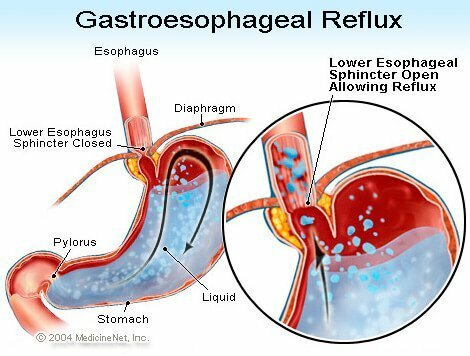 Gastroesophageal reflux: The return of stomach contents back up into the esophagus This frequently causes heartburn because of irritation of the esophagus by stomach acid. Gastroesophageal reflux disease (GERD) can lead to scarring and stricture of the esophagus, requiring stretching (dilating) of the esophagus. 10% of patients with gastroesophageal reflux disease develop Barrett's esophagus which increases the risk of cancer of the esophagus. 80% of patients with gastroesophageal reflux disease also have a hiatal hernia.